Angel Clough | Official Website - Jan 10: A New Goal? 10th Jan A New Goal? Last night I listened to an audio webinar far into the night about "getting in touch with your higher self". I should know better, because I know what will happen, but I always seem to forget. As you might expect, I woke up this morning with fairy tale visions dancing through my head, as I floated through an Alice-In-Wonderland world. It is already bad enough that I have this new website looming straight ahead in my future, taking me way out of my comfort zone. Now I suddenly have all these new scenarios from my "higher self" buzzing around like busy little bees in my brain. Out of this morning’s melee I came to the realization that all of the long term goals I have had for my entire life are fast coming to fruition! So what will I do, now that I will soon have nothing to work toward except leisure, for the first time in my life? My thoughts also touched on the photo that is the centerpiece of this website, since, of course, I actually sent the request to purchase it while I was listening to that webinar. The foreground of the photo is filled with beautiful flowers. 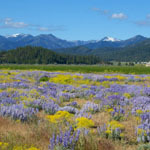 Purple lupine and a yellow "mustard" that is pretty, but is actually a noxious weed that is known as the "scourge" of the valley. Recently I learned that this same plant was highly prized for centuries by English royalty as the source of their Royal Indigo fabric dye, known as "woad". It hitched a ride from England many decades ago along with some farm imports, and has flourished in the valley ever since. As I recalled the frustration of my futile efforts this past year to rid my own yard of it, I began to wonder…..Was there a way to both help mitigate this scourge and provide myself with a new long term goal? In my fairy tale world I fancied myself as a Don Quixote, riding off on my trusty steed, brandishing my sword and seeking to take on any perceived threat to my beautiful Dulcinea. I visualized a factory in the middle of one of the yellow fields that currently dot the valley, cooking up woad by the barrel full, and offering it to the world on the internet. I saw it provide needed local jobs, protect and improve the land, utilize the valley’s abundant solar power, and filter the discharge water to protect the local river from pollution. Wow, what a way for an old dyed-in-the-wool hippie environmentalist to walk the talk. Perhaps my angels knew this all along, and will use this website to find the person I need to help move this idea from the fairy tale realm to an achievable goal. We will just have to wait and see what they have in store for us.